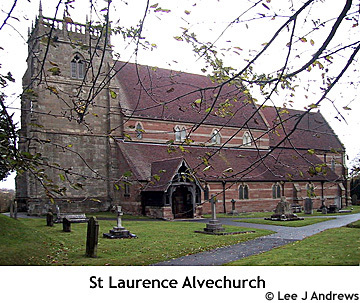 ALVECHURCH, a parish, forming a detached portion of the middle division of the hundred of OSWALDSLOW, locally in the upper division of the hundred of Halfshire, county of WORCESTER, 4½ miles (B. N. E.) from Bromsgrove, containing 1413 inhabitants. The living is a rectory, in. the peculiar jurisdiction of the Incumbent, rated in the king's books at £24. 16. 8., and in the patronage of the Bishop of Worcester. The church, dedicated to St. Lawrence, has Norman pillars; but the chancel displays the early English style, and the tower is more modern. The Bishops of Worcester had a palace here so early as the reign of Henry II, which, after the sale of the manor by the parliament, in 1648, was suffered to fall to decay, and has now entirely disappeared. A hospital for nine persons was incorporated by Queen Elizabeth. The Birmingham and Worcester canal runs through the parish. Fairs for cattle and sheep are held on the 22nd of April and the 10th of August. In 1742, Dr. Worth bequeathed £138. 2. 2., now producing £16 per annum, for the establishment of a free school. The Roman Iknieldstreet passed through Alvechurch, in its course from Alcester towards Lichfield. The learned Dr. Hickes, author of the Thesaurus Septentrionalium Linguarum, held the rectory of this parish.